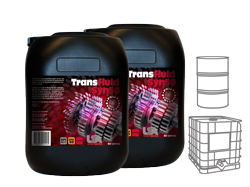 A premium fully synthetic SAE 50 transmission fluid for use in Road Ranger gearboxes and for automotive and industrial applications where extreme pressure properties are not required. Suitable for use in manual gearboxes where an SAE 50 engine oil or an SAE 90 gear oil to GL-1/GL-3 is specified. Recommended for use in EATON (Roadranger) gearboxes and may be used to lubricate various manual transmissions. It may also be suitable for mild gear oil applications in some spiral bevel axle assemblies and worm gear drives of automotive, transport, mining, agriculture and earthmoving equipment.